There has been plenty written about whether or not Spotify can continue to grow at pace in its most lucrative markets. Currently, the company continues to service the bulk of its global subscriber base in North America and Europe: at the end of Q3 last year, the firm had 61.8m paying subscribers across these two regions, with 25.3m in the rest of the world – 17.4m of which were located in Latin America. Soon, some suggest, Spotify is going to have to look further afield if it wants to continue growing its user base – especially its paying user base – to a degree that will satiate Wall Street analysts watching the company. This explains the impetus behind Spotify’s recent launch in the Middle East and North Africa (MENA), and its mooted arrival over the next few months in India. When it comes to overall user growth, however, the company can justifiably look at 2018 as a job well done. 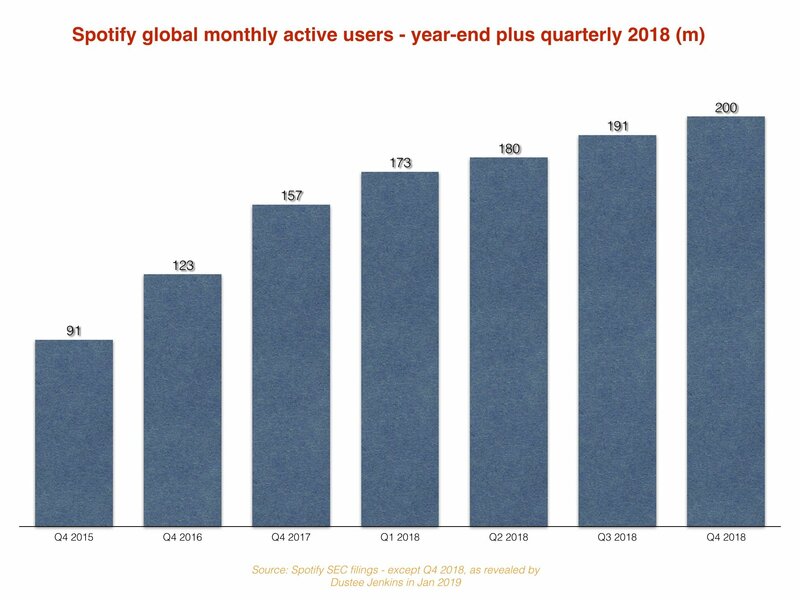 As reported last week, Spotify has confirmed that it reached 200m monthly active users (MAUs) by the end of December last year. Running the official numbers shows that Spotify added at least 43m MAUs in 2018 – the difference between its official year-end figure in 2017 (157m) and the 200m figure which has now been announced. 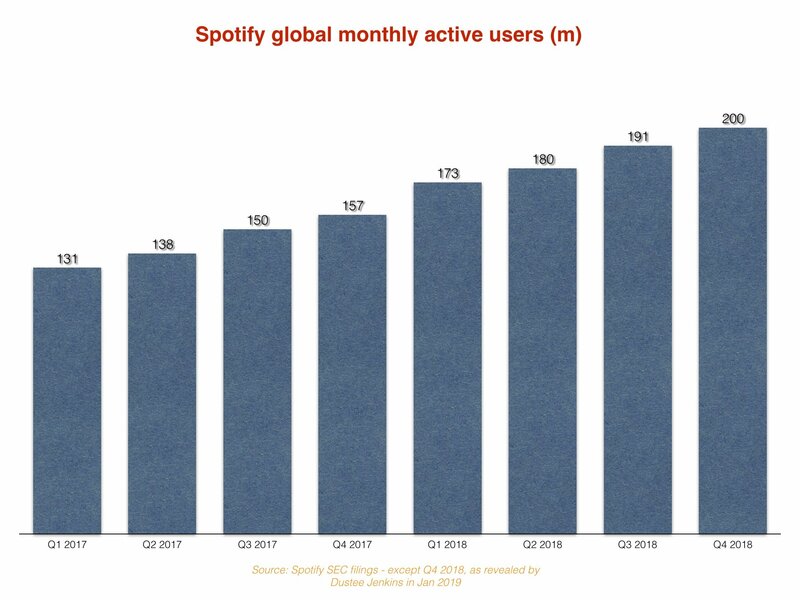 By comparison, in 2017, from a year-end 2016 position of 123m MAUs, Spotify grew by a significantly smaller 34m MAUs worldwide. That, in turn, was bigger than the 32m MAUs Spotify added in the calendar year of 2016. All eyes now will turn to Spotify’s worldwide paying subscriber base. The company finished 2017 with 71m premium subscribers, according to its SEC filings, which represented annual growth of 23m subs on the 48m who were paying for Spotify at the close of 2016. 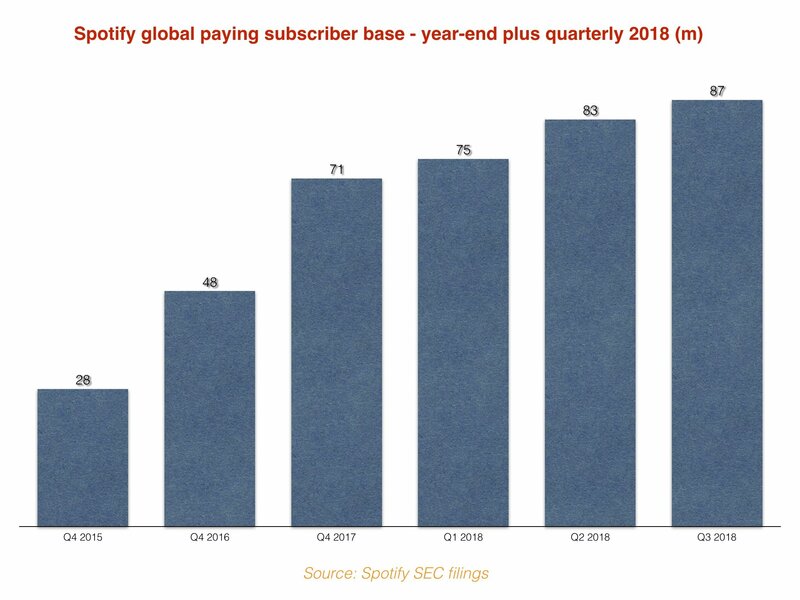 In its Q3 financial results last year, Spotify forecast that it would end 2018 with somewhere between 93m and 96m paying subs worldwide. It will confirm the final number next month. The lower end of this guidance (93m) would see 22m subscribers added last year (versus the 71m recorded at the end of 2017), while the higher end (96m) would see 25m additions. The lower end of the forecast, then, would represent a slowdown in annual Spotify subscriber additions; the higher end would represent a (slight) increase on 2017. The metric that may matter most to Spotify’s record company partners here – and some investment analysts – is the firm’s paid conversion rate. If we posit that Spotify ended last year with 200m Monthly Active Users and 95m paying subs, it would mean that 47.5% of the service’s total user base was paying for their access to music. At the end of 2017, with 71m subscribers and 157m global MAUs, Spotify’s paid-conversion percentage figure was slightly lower, at 45.2%. And at the close of 2016, with 48m subs and 123m MAUs, Spotify’s paid-conversion percentage sat at 39.0%. Quite what Spotify’s subscribers are paying, on average, is another topic altogether. 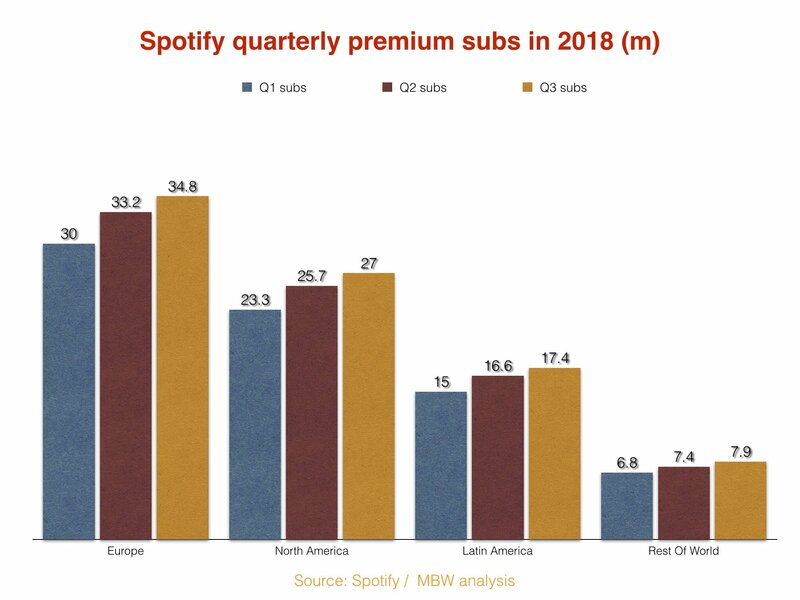 In Q3 2018, the average global Spotify subscriber was handing over the equivalent of €4.73 per month – down over €2 from the same number in 2015.